Meeting this American Hero at Mary Ann’s Diner in Derry, NH on a Saturday morning, I was amazed at how quickly and confidently he used his smartphone. While eating, he showed me lots of information about his World War II unit and its planes, moving rapidly from one screen to the next, at a speed that would put any millennial to shame. Sgt. Peter D’Ambrosio, born during the “Roaring 20’s”, was an expert at using 21st century technology. Reading a Veteran’s DD 55, also known Discharge Papers, (now known as a DD 214) is a task routinely done in Human Resources offices, town halls, and at VA Hospitals throughout the United States. On my desk, while I write this, is the “Enlisted Record and Report of Separation-Honorable Discharge” of Sgt. Peter A. D’Ambrosio, 73th Bomber Wing (B-29) U.S. Army Air Corp, Pacific Theater of Operation, World War II. Sgt. D’Ambrosio was qualified on the M1 Carbine, received the Good Conduct Medal, both the American and Pacific Campaign Medals, and the World War II Victory Medal. According to his discharge papers, he participated in the “Air Offensive against Japan”. He served nearly three years, almost all of it on the Island of Saipan, where he serviced the planes tasked with securing the unconditional surrender of the Empire of Japan. After finishing basic training, Sgt. D’Ambrosio spent ten weeks in Biloxi, MS to become an Aircraft and Engine Mechanic. He later trained in San Diego, California on B24 Liberators for about a month, then abruptly was transferredto Kansas to train on the B29 Superfortresses. The B29 aircraft, which their crews called ships, was the world’s first pressurized bomber and was also equipped with remote controlled machine guns. His unit was known as the 58th Bomb Wing, which eventually turned into the 73rd Bomb Wing, then the 500th Bomb Group, which was made up of three squadrons, deploying to Saipan in the Mariana Islands. Peter said that in nine months of operations, his unit conducted seventy nine bombing raids on Japan. During most of his time on Saipan, he was a crew chief on the Cessna UC-78. According to the Collin’s Foundation’s website, the plane, known affectionately as the “Bamboo Bomber” because of its wooden construction, was well known as a multi-engine trainer of WWII. Many bomber pilots had their initial training on this aircraft. Talking with Sgt.D’Ambrosio, the official use of the UC-78 aircraft on the Islands of Tinian and Saipan, was moving U.S. Mail, critical medical supplies and repair parts from Island to Island. However, he said with a grin, the B29 Bomber pilots could check one out, and often did, taking Army nurses sightseeing while off duty. Saipan was captured in July 1944, and with its airfields built by U.S. Navy Seabees was fully operational by October 1944. Saipan was well suited to bomb Japan from using the B29. 20th Air Force was on Saipan and the 21st Air Force was on Tinian, both units maintained a HQ on the Island of Guam. Each Island had over 300+ B 29s. Peter said that air raids with 1,000 B29s were common in the last months of the war against Japan. He was an eye witness to the B29 “Enola Gay” leaving neighboring Tinian to drop the first Atomic bomb on Hiroshima, Japan. Three days later a second B-29, “Bockscar”, dropped another atomic bomb on Nagasaki. With a range 3,100 miles, the legendary B-29 Superfortress was manufactured by Boeing, the company’s website states that “The earliest B-29s were built before testing was finished, so the Army Air Corp established modification centers where last-minute changes could be made without slowing expanding assembly lines. Boeing built a total of 2,766 B-29s at plants in Wichita, Kansas. B-29s were primarily used in the Pacific theater during World War II. Two other companys also built B 29s during World War II, Glen Martin and Bell Aircraft. Many World War II, Korea, and Vietnam Veterans have told me stories of being hassled by the career NCOs (often called lifers by both officers and enlisted men) while they were mustering out, at the end of their military service. Sgt. D’Ambrosio’s experience was quite different, after Japan surrendered, his unit was moved to California, where he spent a week at a USAAC camp in Redwoods, California. The locals invited him and his squadron mates to Christmas dinner, then, after a few days, he was put on a train to Fort Devens. 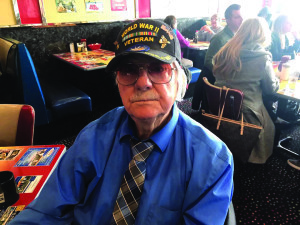 Peter D’Ambrosio considers himself lucky having served in World War II on Saipan with his twin brother Anthony, and his cousin Peter Campino. He had another brother Michael, too young to serve, and a sister Lilian, who later became a Massachusetts Judge. He and his wife Elizabeth, now deceased, have two sons, Bruce living in Los Angeles, CA and Brian up in Brentwood, NH. Besides his skill on computers, another interesting fact about his life is that he graduated from the High School of Commerce (now English High) Class of 1941, the graduation ceremony guest speaker was Red Sox Left Fielder and future U.S. Marine Pilot, Ted Williams. Becoming a pilot himself after leaving the U.S. Army Air Corp. He owned several planes, and he used to fly out of the now closed Tewksbury Airport, and now flies with his friends out of Lawrence’s Airport. Mr. D’Ambrosio’s post war career including stints in both the computer and electronics industries. Entering the computer industry in its infancy in the 1950s. He started in key card era, when trucks and professional riggers were needed to move computer equipment, and today is more proficient on a computer and a smartphone than most Americans. It was an honor and a pleasure to have breakfast and two detailed conversations with this “hero in our midst”.